Mouseover text: "There's one person in Missouri who says "carbo bev" who the entire rest of the country HATES." 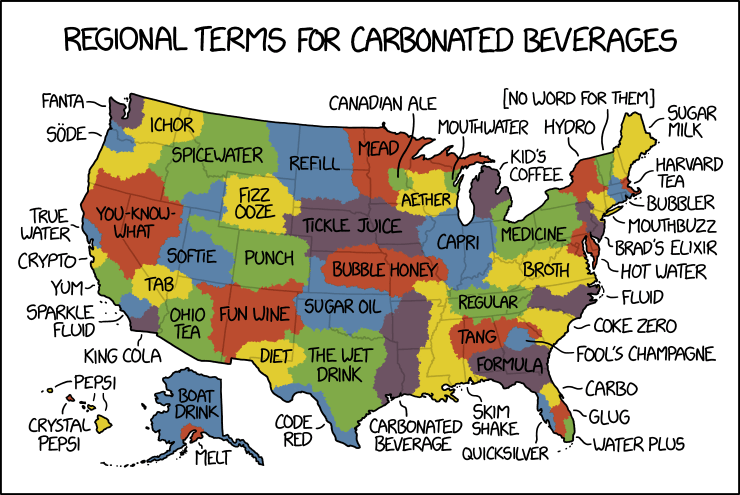 alt="Carbonated Beverage Language Map"
I've always wondered why the original map doesn't have 'soft drink' as one of the options. It's by far and away the most common among my peers here in southern Alabama. As a native northeasterner, I say soda, but I do feel that perhaps it's becoming old-fashioned. It's my sense that soda is not used in marketing or advertising, where soft drink is the preferred generic term. @Michael: Similarly for "tonic", which was once the most common term in much of New England (although I can't say that I've heard it recently, other than in reference to what nobody any longer calls "quinine water"). (2) A typed notice, taken from elsewhere, on the bulletin board in Harvard's music building (mid-1960s), giving instructions on what to do with "tonic bottles", under which was handwritten: "But what do we do with subdominant bottles?" What is happening there in St Louis? Here in the UK, we'd say "fizzy drink", at least when talking to children, otherwise might say "soft drink" but that covers anything cold and non-alcoholic. When I was growing up in southern England (1960s) the word we used was 'pop'. Coke meant specifically cola (of the Coca or Pepsi or any other variety), and soda was pretty much unknown, as far as I can recall. 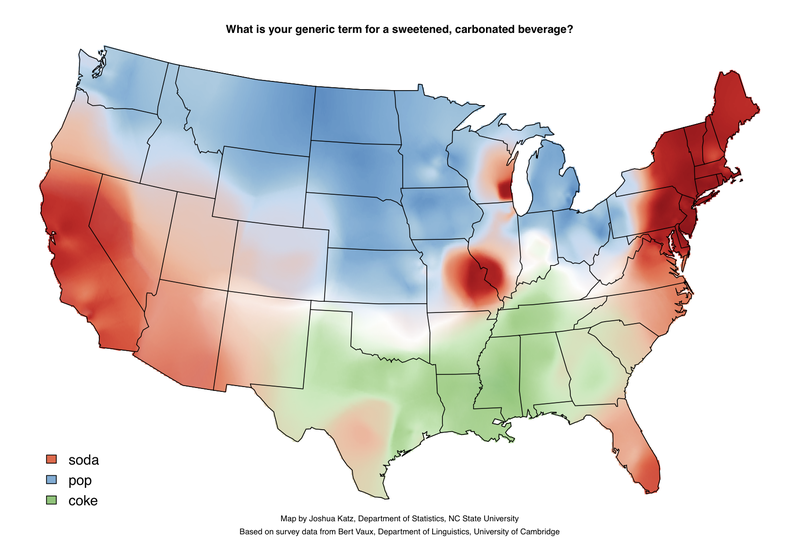 As a resident of Western NY, I was basically on pop-soda border, and my wife pointed out that I use the terms differently. I thought I used them interchangeably, but she's quite right. Something that comes free flowing from a machine or the like is a "soda," while something that comes pre-packaged (as in a bottle or can) for me is a "pop." I don't think this breakdown was ever explicitly taught to me, so I assume it comes from association with the term "soda fountain." That being said, as far as I can tell, this is just my wildly idiosyncratic idiolect. Cheers all! We here in the Lou (St. Louis) definitely say "soda"… would be interesting to know the history of this. We've always had a lot of people who left after high school to go to the North East and then come back to rear their kids. Generation after generation of this pattern, but still hard to imagine that such salmon-like emigration-immigration of relative elites would move the bulk dialect meter much…. Miles, I have lived in the US since the early 80s so I really don't know what I would call if I were in England! Plus I never drink the stuff anyway. Why do they always stop these maps at the US-Canada border? Surely it's linguistically interesting to compare with areas north of 49° … or is there a ban on passports for linguists? It's an interesting but I'm not sure after living in New Hampshire, Massachusetts, and Maine most of my life that I've ever heard the term "sugar milk" or "Harvard tea" EVER. @ Robert Coren, my first-experience story runs along somewhat similar lines to yours. On my first day in Cambridge, in September 1968, I went to the local supermarket (now as then called "Stah Mahket") in search of quinine water. I looked up and down the soda aisle and didn't see what I was looking for, so I asked the nearest clerk where the tonic was. "Aisle 7" (or whatever). I said I had just looked there and didn't see it, whereupon his eyes opened like saucers and he said "But the whole aisle is tawnic," at which point I realized what we had there was a failure of communications. WallyW: Code Red is a cherry-flavored, red-colored variant of Mountain Dew. This is incorrect. In Rhode Island "bubbler" (pronounced "BUB luh") DOES NOT refer to carbonated beverages. It is the word used for "drinking fountain." @PeterL: In one of the epigraphs to his novel "M/F", Anthony Burgess quotes a linguistic atlas (can't remember which one) to the effect that there is no isogloss coincident with the political boundary at 49 degrees North. @Joe Post: I would imagine there are at least a few fairly sharp border isoglosses that are typically for things where the referent is government-regulated. "Grade 12" is as I understand it a common Canadian synonym for "12th grade," for example, but sounds markedly odd to a US ear. Before the ravages of metrication, common measure words like "pint," "quart," and "gallon" meant (at least by default) measurably different things on different sides of the border — I'm not sure if that's exactly an isogloss but it's something close. And to this day "dollar" without further specification means something different. The St. Louis "soda" island is not that far from another one centered around Milwaukee, which like St. Louis is historically a center for the mass production of beer. One speculative hypothesis that might fit the data is that "soda" could have been beer-industry-insider jargon for that particular range of competitive beverages and used uniformly nationwide within the industry — with it thus leaking out into more general usage in locales where industry-insiders and their family members are a more material percentage of the local population. My mom fwiw grew up in Western N.Y. very close to the pop/soda boundary and sidestepped the issue by usually saying "soft drink." As to pronunciation, isn't there a US/Canada isogloss for "about" and "hot"? XKCD is an idiosyncratic humor webcomic. It's a joke. I think a better term is "geeky" than idiosyncratic. Growing up in Western New York, I used the term "pop" exclusively. But then when I left for college in New England, I soon adopted "soda", and never used "pop" again. I began to look down on the use of "pop" as a term of a prescriptively-inferior dialect. That being said, I wonder why Seattle uses "pop", since the population tends to be more educated. The rest of the coastal elite uses "soda". @Aelfric: did you watch TV a lot? I notice when I lived in the area, Wegmans used to (and still does) advertise their private-label brand of soda as "pop", so that might have been an influence? @Michael: "Soft drink" seems more formal to me, and is longer, both phonetically and etymologically, than "soda", "pop", or "coke". so it is not a term used in the peer group that is being compared. Above I meant to write "orthographically", not "etymologically". That area in Texas that is like labeled "the wet drink" should have been "soft drank". "Mineral" was the standard word in Ireland until the 1970s; under-50s can now only use it affectedly. I guess the replacement for adults is "soft drink" — which ought not to imply 'carbonated', but in practice does because non-carbonated soft drinks are now mainly consumed by children (who can use "fizzy drink" for carbonated ones). As an L2 outsider, what strikes me is how rarely I have occasion to use in English a generic label for this class of drinks, rather than refering to a specific brand. When I do, though, I use "soft drink" – either "soda" or "pop" would feel affected, and "coke" to me means specifically Coca Cola (or the coal-based fuel, which is not suitable for human consumption). Now I live in SoCal and while I have mostly excised my accent (“thayat mayan has a tayan vayan”), I do wish to keep this portion of my idiolect, so I have generally switched to saying “soda pop” so that people understand me yet I can still use “pop”. My wife is from Canada (born a Newfie, went to middle school in Quebec, high school & later in Calgary) and has since adopted “pop” in solidarity, though she over-broadens the vowel (I think on purpose for fun) to “paaaahp”. @Lidia — I DID watch TV a lot, although I am old and also grew up in a benighted part of Western New York which didn't have a Wegmans until I was an adult (though it is now, of course, absolutely integral to the society). Still, I am sure TV had a tremendous impact! @Michèle Sharik Pituley — My wife is Calgarian, and occasionally references "pop" now as well, but your anecdote reminds me that when I pointed out that my wife had the cot/caught merger, she started (and never stopped) making fun of me by pronouncing "caught" with a ridiculous overbroadened vowel which makes her sound like the old SNL (S&L?) skit "Coffee Talk." Seems from above that some people still don't get that this is a joke. None of these terms are supposed to match ones actually in use. This kind of ;humor' is, to be fair, rather obscure, and it might not be a bad idea to signpost it whenever referencing XKCD. 105. What is your generic term for a sweetened carbonated beverage? @D-AW: "dope"? That one really surprises me. What about soda-pop? I'm Australian, so this might sound like false memory syndrome. But I recall, in the 70s, reading comics or watching shows from the 60s, and coming across that term. Google n-gram suggests it was occasionally used, more often post-war. If so, did it arise in 'border' regions? Or maybe it was a neologism to appeal to two different dialectical audiences. As a Canadian on a Lufthansa flight in the 90s, I asked what kinds of "pop" they had, and the German flight attendant burst out laughing, repeating the strange word I'd just said: "Pop! Pop! Pop!"